My little buddy wishes you a very Happy Thanksgiving (or, Happy Thursday, depending on where you live) while wearing his new mittens! Pattern: Dulaan Easy-on Mittens by Julia Farwell-Clay. Very, very clever, and easy and quick to knit. I made these a little bit smaller than what’s listed in the pattern by cutting some stitches and rows here and there. Yarn and Needles: Berroco Vintage in 5175/fennel (left over from this project), and 5166/sakura (left over from this project). Just a few yards of each, really. I used US 6 needles. 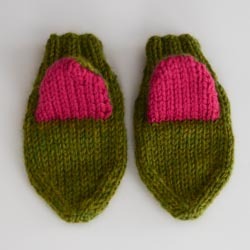 As you can see, I knit the insides of the thumbs with a bright pink yarn, and then sewed two eyes on the hand side – circles cut out of craft felt. 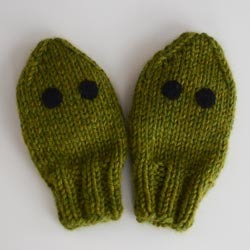 We are calling them “dinosaur mittens” in this household, but you can also imagine them being lizard, snake, or crocodile. I saw this great adaptation on Ravelry (the duck variation also caught my interest). Gregory seems to really like them, and they are far easier to slip on than store bought fleece mittens. 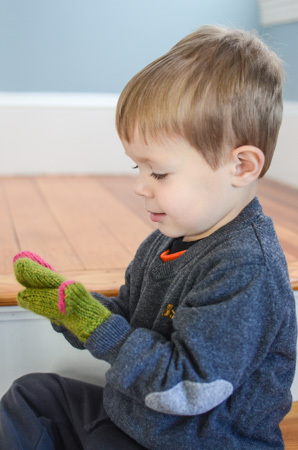 I’m glad my little guy’s mittens were an inspiration for yours! To get my son to hold my hand when crossing the street, I say, “Oh no, Monster! Don’t eat my hand!” And he will chomp on (hold) my hand the entire time. Gregory is growing to-o-o-o-o fast…he’s just beautiful! 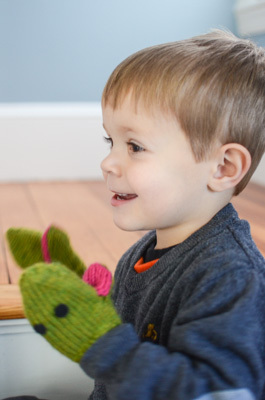 I have a 26 month old grandson who has been obsessed with dinosaurs for almost a year now…and I’m definitely going to make him a pair of dinosaur mittens for Christmas! I know he’ll be over the moon in love with them! Thanks so much for sharing! Very cute! I have a similar pattern for chipmunk mittens. I love those mittens! 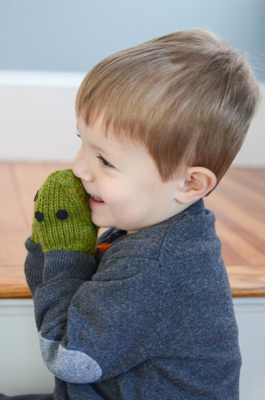 I think I need to knit some for my friend’s little boy (he’s three). I think he’d love dinosaur mittens. Those are super adorable. I will have to add them to the list for when my little boy is a lot older! Love the mittens, and he’s so cute!